My Flannel Friday this week was stolen from the brilliant storytime katie. I fell in love with her band-aid storytime activity. According to her blog post, the idea was inspired via crowd-sourcing…GO TEAM #FF!!! In the past I have mentioned that I am one of the all-time worst puppeteers. For a while I tried to improve my skills, but I’m a lost cause. I am simply too used to my hand being a hand, I just can’t carry on a conversation with it. I get distracted, and I forget who is saying what… it’s pretty pathetic. At some point I noticed it was making parents uncomfortable, and I decided to give it up, and go puppetless. Then one day I was walking through Constructive Playthings, and came face-to-face with the cutest, fuzziest little puppet face I have ever seen. It was love at first sight. I actually tried to talk myself out of buying her. But once, I picked her up, I just couldn’t leave her at the store. (writing this, I realize it is very similar to the story of how I ended up with my 2 dogs) Still, I wasn’t convinced that the kids would like her. She kind of intense, not subtle at all. Oh I forgot to mention my favorite thing about Gertie. The real magic is that she has a squeaker. So I don’t have to worry about providing a voice for her. I tell the kids that Gertie, “talks funny, in her own special language” and that seems to suffice. 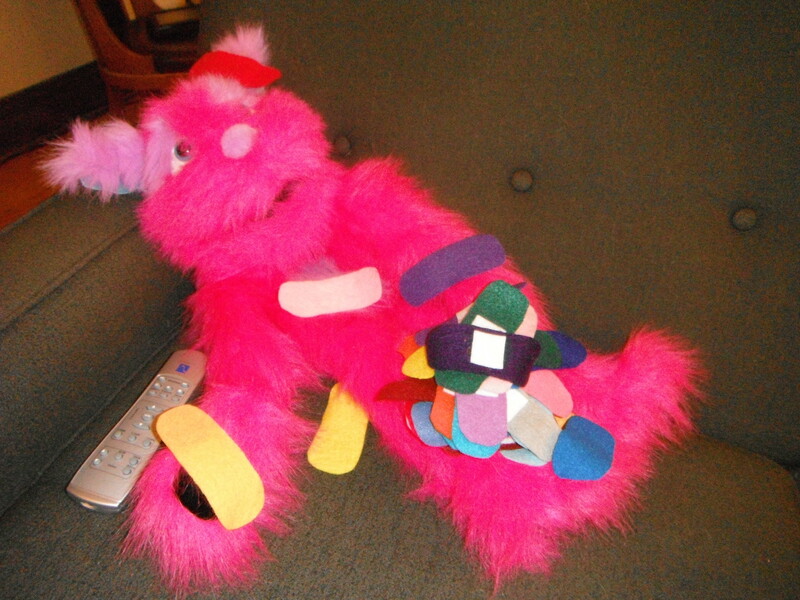 As much as kids hate boo-boos, they lllooooovvvvee band-aids. And this will give Gertie a little more face-time. I will try it next week, and let you know how it goes. I’ll try to come up with a decent rhyme over the weekend. In the meantime, here’s a picture of Gertie convalescing on my sofa. Poor Gertie! She's had a rough day. Katie is hosting the #FFRU this week. Hit the colorful #FF button in the sidebar for the growing archive. I love your Gertie story. It sounds like she’s working for you. I used a puppet in Storytime for the first time two weeks ago. I used a turtle during songs where he went to sleep and went in to his shell and then woke up and came out of his shell. Isn’t it amazing how just a tiny bit of positive feedback can totally change your outlook on your abilities? I try to keep that in mind when I’m too nervous to try something new! I have a dog puppet that barks, which is similarly helpful. I’m pretty good at doing puppet voices when I’m behind a stage, but being in front of kids and caretakers, I freeze up. That’s why the puppet just whispers in my ear and I translate for everyone. Gertie is awesome! I am loving all these bandaids people are making too. I might need to try making my own. I also occasionally toy with the idea of a puppet, but I’m too chicken to do a voice. I like your approach with the squeaker! Thanks. The squeaker is awesome. It’s great to not have to think about a voice. “Is it hurty, Gerty?” GENIUS. 😀 Love that you were able to adopt a mascot on your own terms. I don’t have one, but I can definitely see the appeal of Gerty (and her squeaker voice!) – thanks for sharing this! I love that Gertie has a squeaker voice! It’s a good angle. It took me a long time to get used to Miss Mouse, and you’re right it was hard to embrace, but the kids love it so much! Tell Gertie it was great to meet her! Thank you for sharing how you worked your way through an awkward situation with puppets and were still open-minded enough to try again ~ in a new, creative way. It is a good example of how things we don’t think we can do might just need a little tweaking to become a fun, exciting part of our storytimes. Your storytime friends are very lucky to have you ~ and Gerty, too! Uh oh! My sincere apologies to Gertie! I misspelled her name. So sorry! thanks! it’s amazing. if you told me just 4 years ago (when i was working in the corporate world, GROSS!) that i’d be doing half of the goofy things i do in front of 50 people day in and day out, i’d think you we crazy. but i can’t imagine how i’d get up in the morning if it wasn’t for storytime.